An online marketplace for food grown locally in the Tamar Valley, addresses the burden of marketing and distribution, enabling farmers to focus on production. ​Three distinct food producers achieve their individual goals while providing social and ecological benefits to one another. Multiple food producers operating under single brands access wholesale markets through collaboration rather than competition. Provides startup support, land access, and basic infrastructure for fledging farm businesses. Operated in collaboration with the city of Plymouth, creates a market for a rural producer network that addresses food security in the city while providing education around healthy eating. ​The River Tamar flows southward for 61 miles between Devon and Cornwall, creating an almost completely natural border between the two Southwest England counties. Its valley was once home to a thriving market garden economy, with origins dating back to the 16th century. That economy prospered for many centuries, thanks in part to the valley’s unique micro-climates, created by steep, sloping hills and tempered by the tidal flow of the river. Food producers were historically able to capitalize on earlier harvest times for soft fruits that were then sold into the regional city markets of Plymouth and London. This demand from neighboring urban centers made horticulture a viable profession for many residents of the Valley up until the mid-twentieth century, when the hitherto sheltered local food economy was made vulnerable to the competing forces of globalization. By the early 21st century the number of growers in the Valley had dwindled from the thousands in 1955 to only twenty in 2002. Helena Pachowska of Rabbit Acre, a market garden specializing in garlic and soft fruit. Rabbit Acre is part of a CSA project managed by Tamar Grow Local. ​​Building on the Valley’s rich agricultural history, Tamar Grow Local was purposefully conceived in 2007 to revitalize the local food economy by addressing the many barriers to long-term enterprise success that small-scale farmers had been experiencing in the region: “We want to encourage horticultural production again, but in a way that makes it profitable and realistic as a livelihood strategy in the valley,” says Simon Platten, Tamar Grow Local’s director. To realize its mission, the organization has developed a series of interrelated projects that provide marketing and distribution, cooperative development, shared infrastructure, and land access for agricultural producers throughout the Valley. 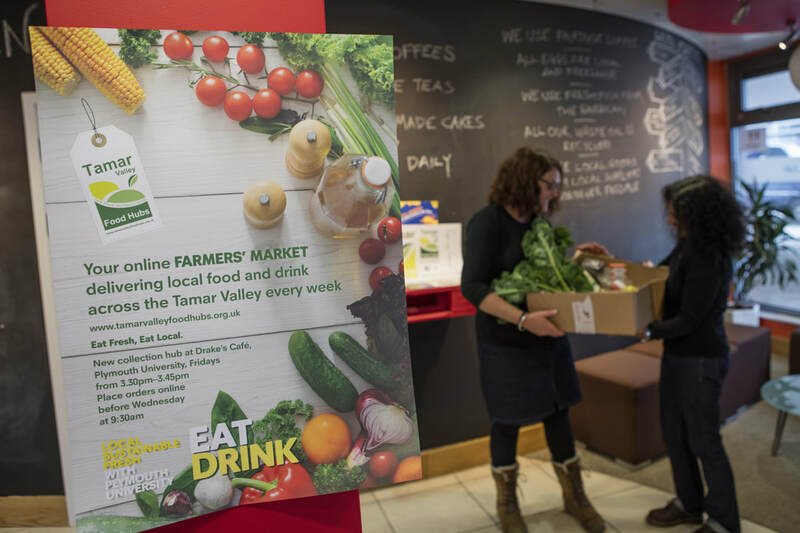 Tamar Valley Food Hubs, an online marketplace for food grown locally in the Tamar Valley, takes on the burden of marketing and distribution for local farmers, enabling them to focus on production. 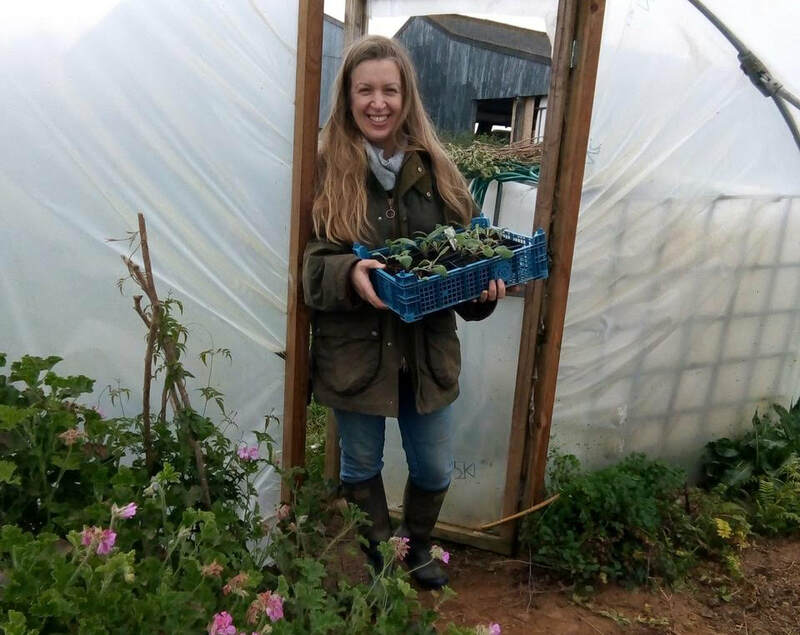 After researching the practices of established food buying group models in England and abroad, Tamar Grow Local created its own food hub in 2013 to connect local producers with new customers in their region. Its goal was to secure wholesale price premiums otherwise unavailable to growers through previously existing routes to market. Tamar Valley Food Hubs combines online purchasing and distribution with a personal touch. The Open Food Network, an international organization whose open source software supports local food system projects around the world, was identified to be an affordable, user-friendly software solution for the Food Hub’s online platform, and the hub went live with it in 2016. Sales are now transacted on this virtual marketplace, but food is distributed in person through door-to-door delivery, ensuring that the channels of communication are always open between the hub and the people it serves. “It’s all about allowing information and people’s voices to flow through the system in the easiest and most multi-directional way possible,” Simon reports. This same attention to information flow and access is designed into projects like the Harrowbarrow and Metherell Community Orchard, which benefits from the intentional cooperation of three different food producing groups--the apple orchard itself, a beekeepers’ cooperative, and a Pig Society. Each entity achieves its individual goals while providing social and ecological benefits to the others. For example, the pigs feed off the invasive understory of the apple trees and facilitate orchard management. At the same time, beekeepers are given a space for bees to forage and the bees in turn provide pollinator services throughout the farm ecosystem. By virtue of sharing the same space, projects that might otherwise operate in isolation are instead structured to receive mutual support from one another, thanks to backbone organizing from Tamar Grow Local. 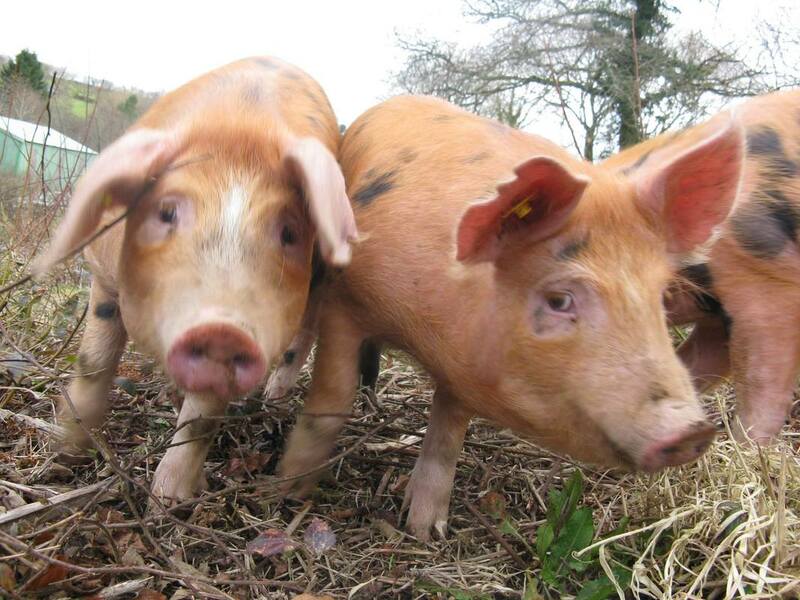 The hard working pigs of the Harrowbarrow and Metherell Community Orchard feed off the orchard's invasive understory, contributing to its management. The cooperative organizational structure of two new value-added products—a shared-label honey brand and a Tamar Valley-labeled apple juice—has also played a key role in supporting local farmers. Both businesses benefit from pre-established routes to market through the Tamar Valley Food Hubs online marketplace and other wholesale outlets. In setting up a honey extraction facility and processing center, Tamar Grow Local has organized multiple honey producers under one brand, allowing them to collectively access a higher wholesale price point through collaboration rather than competition. 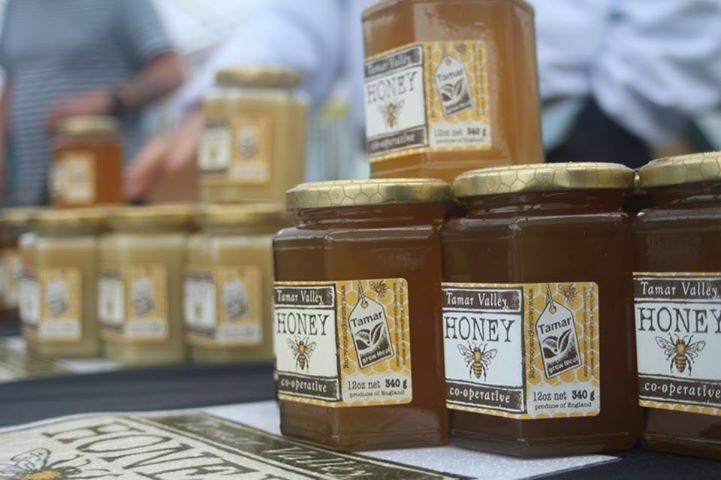 Tamar Valley honey producers thrive through collaboration rather than competition. Community-based food projects like the Harrowbarrow and Metherell Orchard are also the outcome of Tamar Grow Local’s desire to foster a continuum of food production throughout the Tamar Valley agricultural sector—from recreational, community-scale engagement, to more committed market gardening, and ultimately commercial-scale farming for wholesale, regional distribution. Recognizing the considerable barriers to entry for new farmers in the region, the Farm Start program was launched in 2015 to provide startup support, land access, and basic infrastructure for new farm businesses on twelve acres of shared land. Kelly Chevin is growing her fledging Native Flower Farm as a tenant of Tamar Grow Local's Farm Start program. Tenants of the program—which now include a vineyard, native flower farm, and various market gardens—are provided a route to market through the food hub, and also encouraged to develop relationships with wholesalers at the regional level. 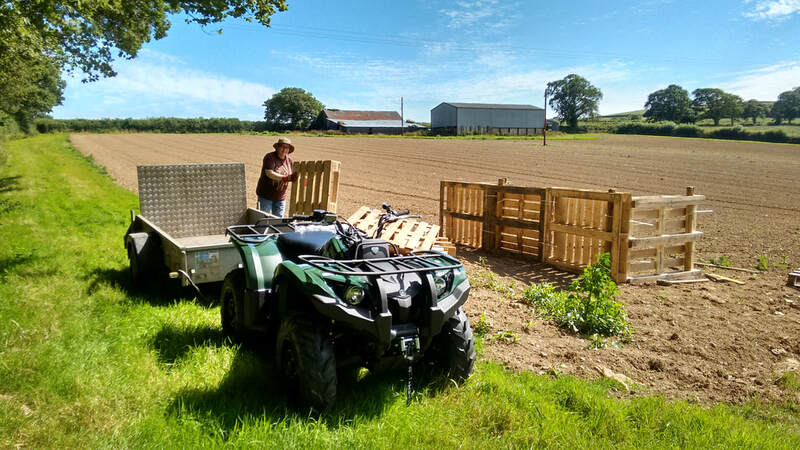 Similarly to the Harrowbarrow and Metherell Orchard, there is continual information exchange and resource-sharing among tenants as they share land and equipment, with common farm implements made available through a tool bank, also operated by Tamar Grow Local. Grow, Share, Cook from Fotonow CIC on Vimeo. Grow, Share, Cook, operated in collaboration with the city of Plymouth, has allowed Tamar Grow Local to develop an institutional market for its rural producer network while addressing food security throughout the city. Now in its fourth year, the program has blossomed into a highly successful model for popularizing healthy eating and urban agriculture. Since its inception in 2014, Grow, Share, Cook has provided some 40,000 meals throughout Plymouth, both from food grown by volunteers within the city as well as food sourced locally through the Tamar Grow Local network of producers. Originally focused on financially disadvantaged families throughout the city, the program is now working directly with doctors who treat Type II diabetes to help transition patients towards plant-based diets as a form of healthcare. Darin Halifax, Chief Service Officer for Plymouth City Council, reflects that the program has even awakened city officials to the possibility of procurement as a tool for rural economic development and a heightened awareness of the critical ties that bind rural to urban economies: “Our relationship with Tamar Grow Local has allowed us to create a commercial relationship with the rural hinterland,” Darin reports, “to spread out and to work with cross-county partners. It’s been a symbiotic advantage for both of us.” Such projects rebuild past relationships between rural agricultural communities and city purchasing power while also addressing major public health issues through the simple act of eating locally grown fruit and vegetables. Simon Platten reports that resilience is deliberately built into the Tamar Grow Local strategy, with the resources of failed projects always taken up and recycled into new ones. In reflecting on lessons learned over the past decade of work, Simon Platten emphasizes that the churn of small businesses and community food projects should be embraced as a part of natural economic life-cycles, and not a failure of the sector: "You need to support an environment where businesses can set up easily,” he explains, “and when they fail, the resources that have been wound up in them can be recycled and reorganized effectively so they are not lost." Such was the case for the Strawberry Hill Community Orchard, whose financial assets and equipment were transferred over to the Harrowbarrow and Metherrell Community Orchard by Tamar Grow Local after community interest for the former project dissipated. Mark is based in Great Barrington, Massachusetts, where he explores the relationships between food, community, and agriculture in the new economy. You can learn more about his work here, and follow him on instagram at @EarthCultures, where he explores vegetable fermentation as a vehicle for personal, cultural, and planetary transformation. Please share your thoughts on TAMAR GROW LOCAL here.